The MOD-1TE module allows you to measure the temperature with attached popular sensor Pt100, Pt500, Pt1000, Ni100, KTY81-110, NTC (Carel) and thermocouple (type J, K, T, N, S, R, B). In addition, it is possible to measure voltages in the range 256mV (10μV resolution) and to 2048mV (100μV resolution) as well as the measurement of resistance to 8kΩ. The module MOD-1TE communicates with all commercially available PLCs and other devices that support popular Modbus Master protocol. The device has a one input for the temperature measurement. It is possible to 2- or 3-wire measurement of sensors Pt100, Ni100, Pt500, Pt1000 and 2-wire measurement thermocouples and other sensors. In addition, the module is equipped with 1 configurable digital output (alarm). Values are read via RS485 (Modbus), so we can easily integrate the module with popular PLCs, HMI or PC equipped with the appropriate adapter. 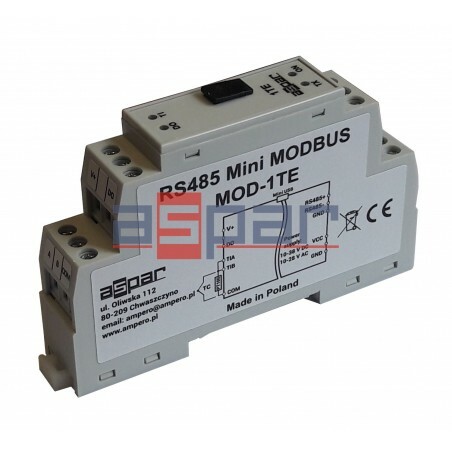 This module is connected to the RS485 bus with twisted-pair wire. Communication is via MODBUS RTU or MODBUS ASCII. The use of 32-bit ARM core processor provides fast processing and quick communication. The baud rate is configurable from 2400 to 115200. 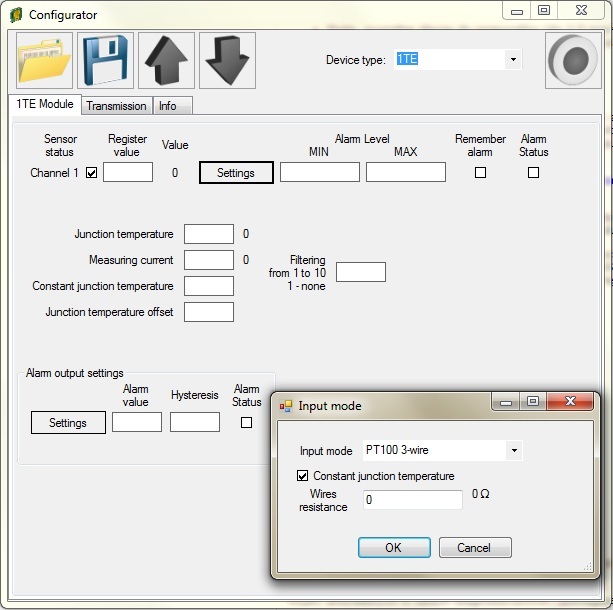 Module configuration is done via USB by using a dedicated computer program - Modbus Configurator (free). You can also change the parameters using the MODBUS protocol..